Use a 6-quart slow cooker. Rinse your lentils under cold water, and place them into an empty slow cooker. Add beef broth, and sliced sausage. Add the entire can of tomatoes and a cup of chopped carrots. The broth and the seasoning from the sausage is enough to flavor this dish– there is no need for additional spices. Cover and cook on low for 5 hours, then stir in fresh spinach. Cover again and let the spinach soften for about 15 minutes. Serve in a shallow bowl with cornbread. Preheat oven to 400 degrees F. Lightly grease an 8×8 inch baking pan. In a large bowl, mix flour, cornmeal, sugar, soda and salt. Stir in yogurt and eggs. Do not over mix, stir only until well blended. Pour batter into prepared pan. Bake in preheated oven for 20 to 25 minutes, or until center of the bread springs back when gently pressed. I have never met someone who loves soup more than Jason. The year before we were married and he was living with some friend in Oshkosh, WI, he would bring soup for lunch every single day. While I enjoy soup, I usually only like to have one bowl a week. Since we have been married, we have stopped buy canned soup (unless it is the low-sodium version and is on sale for $1 per can). Instead, once the first chill of fall comes I start up the crock pot and begin making batch after batch of soup and chili. One crock pot usually makes 4 large yogurt containers worth of soup (we eat a lot of yogurt, so we save the containers). I will keep two in the refrigerator and two in the freezer for later. Soup is fool-proof and works well with pretty much any items we have on hand. I try to always use fresh ingredients, but this is not always possible, so I usually keep extra cans of diced tomatoes, beans, and frozen vegetables on hand. If you use dry beans, be sure to soak them overnight before using them. This well help get some of the gas out and prepare them for cooking. Since the weather finally seems to be turning around (55F and sunny today!) I decided it was a good day for one last batch of soup. Soup can really be anything you want, so if you don’t have or like some of these ingredients, feel free to substitute something else. Place all of the ingredients in a 4-5 quart crock pot. Stir well. Cover and cook on the LOW setting for 5 hours. 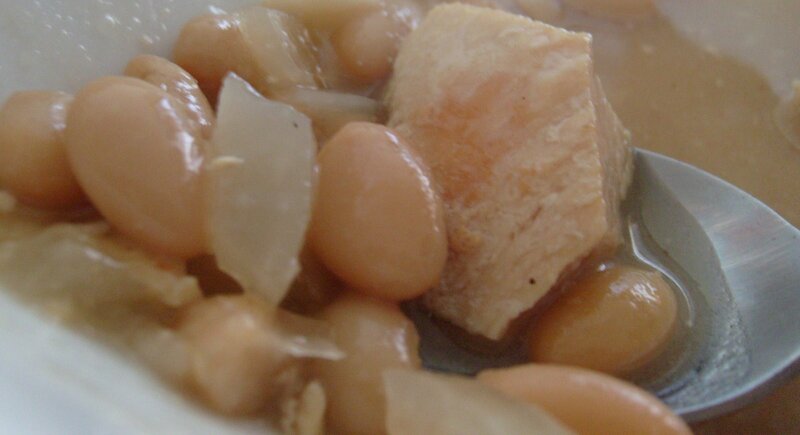 If you use dry beans, you may need to cook it longer. Although it is not officially winter yet, it sure feels like it! Today it has been in the teens all day with the windchill feels like the single digits. Jason and I love eating soup and chili when it is cold like this. I usually never buy canned soup because it is so easy to make in the crock pot. I wanted to try something new, so after skimming some white bean chili recipes online, I came up with my own simple version. It turned out great, especially for a first try! Combine all ingredients in a 3-4 serving crock pot. Stir well. Cook on high for 5 hours, stirring occasionally.